FRESH SEAFOOD. NO BAD DAYS. Let's face it: there are a lot of places to eat seafood in Myrtle Beach. You can't throw a rock without hitting some sort of cut-and-paste franchise tourist trap with unused surfboards hanging on the walls. If that's the kind of place you're looking for, hey, have a blast. It takes a village, right? But what if you're looking for something else? What if you're looking for a place that doesn't care about a fancy address on the strip? What if you're looking for a no-frills local oyster bar where you can enjoy huge, family-style steampots of the best oysters, crab legs, and shrimp you'll ever eat and awesome drinks from the friendliest bar in Myrtle Beach? If you care about fresh seafood, cold drinks, and a cool local vibe, then Bimini's is where you want to be. Bimini's is all about laid-back atmosphere, the freshest shellfish and seafood, and absolutely the friendliest service you'll find. There's always beach music in the air and a friendly crowd where the locals treat out-of-towners like one of their own. That's the Bimini's experience. There's nothing better in Myrtle Beach...or any other beach, for that matter. For over thirty years, Bimini's has been the place where Myrtle Beach locals and visitors alike can find an n0-frills, family-friendly oyster bar serving carefully chosen, perfectly prepared seafood without all the silly kitsch of a tourist trap on the strip. As one of our favorite Yelp reviews put it: "This is the perfect dive bar. I mean that in the best way." There is nothing—NOTHING!—as good as fresh seafood. And Bimini's is all about fresh seafood, right out of the ocean and into your belly as fast as we can get it there. From our almost-world-famous family-style steampots filled with piping hot oysters, shrimp, crab legs and more to our perfectly grilled mahi-mahi, grouper, and other catches of the day, if you've got a seafood itch, we can scratch it for you good. Cold beer and cocktails are an essential part of beach life. At Bimini's we skip the fishbowl drinkware with a hundred plastic toys floating around ( seriously, people need to chill with these novelty drinks! ) 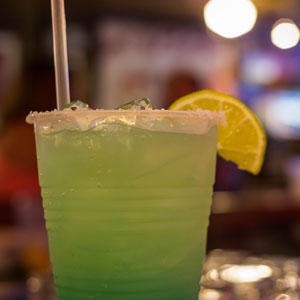 and just concentrate on well made margaritas, mixed drinks, and a great selection of domestic and imported beers served by the friendliest staff around. Everything you need, nothing you don't. It takes more than fresh seafood and great drinks to make a great restaurant. It takes a laid-back mood, friendly service, good music, and lots of smiles. A local restaurant is a place to unwind, a place where you can catch up with old friends or meet new ones. Bimini's has been just that kind of easygoing place for thirty years, locally owned and operated from the get-go, and that isn't changing anytime soon. It's easy to get to Bimini's from anywhere in Myrtle Beach. We're located just off North Kings Highway, south of Tanger Outlets, across from the Kroger Shopping Center. Five minutes from the Myrtle Beach Boardwalk or five minutes from North Myrtle Beach, Bimini's is worth every second either way.